I have many, many things to catch up with here. I'm going to begin with a little bragging. Back in June I did a little carving demo at the annual Gala for the Castlerock Museum of Arms and Armor. I carved a front panel for a document box out of walnut. Just this past weekend I was part of another demo there, more focused on woodworking itself, and I decided to finish up a couple pieces to have as. ". . . and here's what it looks like when you're done." pieces. I spent last week finishing the till, lid, and turning a set of feet. The primary wood is black walnut, the inner till is made from cherry and the bottom is pine, (So you get that wonderful scent when you open the lid) . The box measures approximately 20" across and 14" deep. This small chest is also FOR SALE. I need to make more room for new pieces, (and help finance the materials for them) I'm asking $450 USD. 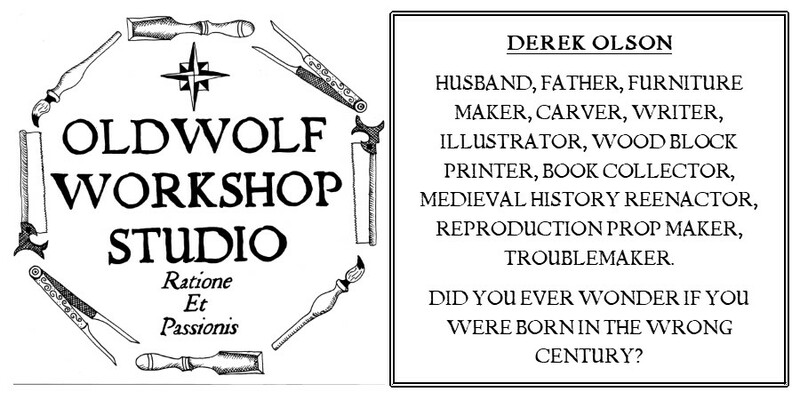 Send me an email (oldwolfworkshop@gmail.com) if you're interested or have more questions. 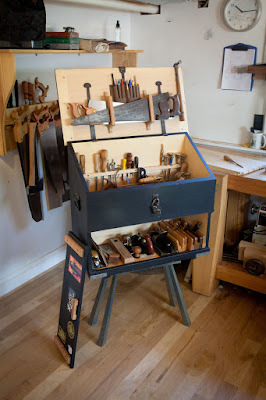 There should be a lot more actual woodworking stuff coming from me soon. At the moment I am also playing with this kind of work. I use soft maple now, which cuts very nicely. I have a question. How do you get the curves of the V-tool work so nice and crisp? Mine tend to be nice and round as long as I go across the grain, but then the chisel tends to dive into the wood when I come along the grain and the curves shape looses a lot of its consistensy. Is it just practice? I have several answers, one or none may help. 1. I'm sure you know that SHARP fixes everything, but I find that even more important on the softer woods I've carved. I have zero experience carving soft maple so I can't speak to it, but I've had issues carving into mahogany and my tools not being sharp enough to leave a crisp edge. Do you find the same issues in different species? Try some oak and see if you have the same issues. 2. The manner of the wood can be an influence as well, green and air dried woods carve differently than something mass kiln dried from a box store. I use the kiln dried stuff more than I'd like but I by far prefer something air dried at least if not riven and just a few weeks away from being a tree. 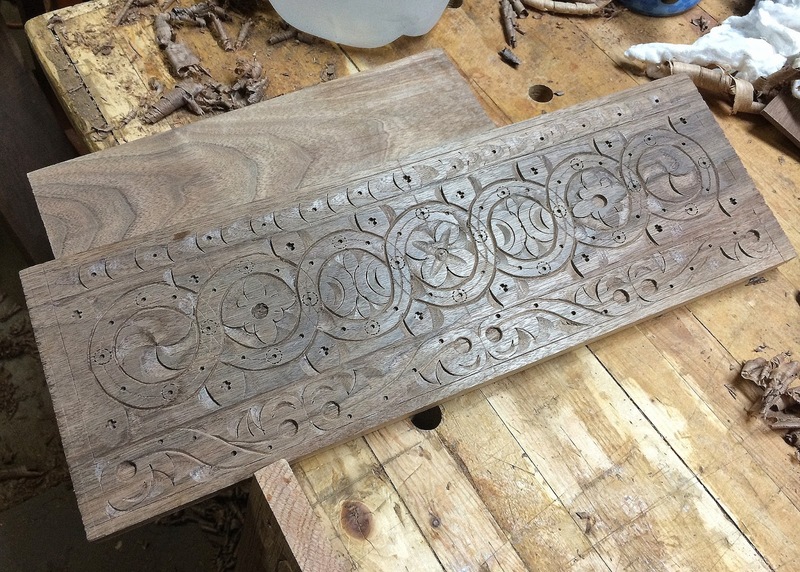 The walnut on this box was air dried and it carved wonderfully. 4. This was a hard lesson for me to learn, but do not get wrapped up in the minutia of the carving and perceived successes or mistakes. This type of carving especially is the sum of all it's parts and that sum is what people will be looking at. There are some big and glaring mistakes I made in the minutia of the carvings of this box, I dare you to find them. Not one person I've challenged, even if they were experienced in this style of carving, has been able to. They eyes want to see patterns, the mind wants to recognize patterns, this is to your advantage. That's not to say, try and do shoddy work, but find the line where enough is enough and don't sweat the small stuff,, it's only furniture. Hope this helps, If you have any more questions I can help with, feel free to let fly. Thanks for your answer. very helpfull. My gouges are very sharp and the maple cuts like butter, so I don't think that is the problem. I am running out of that stuff now, so I will try some oak too. I think your point about not fretting about the details is important too. Some of Follansbee's examples look very rough, but from a distance and with a repetitive pattern it all blends in nicely. I think I have been watching too much at the upper class kind of carving I've seen in some old churches overhere in Europe. They are made by top carvers and are often very neat. I see one mistake in the S-scroll in the lower left corner, but like you say, it is like these "find the 7 differences in the pictures" games. You really have to search for them. Derek very nice as usual. Can I ask where you sourced the hinges?